We are finally in salad season!!! Mother nature has taken her time to bring us warm breezes and lots of sun and with this glorious weather comes BBQ season. A perfect time to spend your days outside with friends and family to enjoy simple yet delicious low carb foods foods. We all know that BBQ usually includes delicious grilled meats, veggies and salads. Lets face it though, there is more to salads than caesar, creamy potato and macaroni. Not only are those salads loaded with sloppy sugary dressings but they are a bit boring. I love a great garden salad with a vinaigrette dressing but again, ho hum. This salad is delicious with a little bit of a bitter kick from the kale and slight sweetness from the drop of honey in the dressing. I would highly recommend using black or “dino” kale as I find it has a more subtle flavour than regular green kale. The deep green leaves of the black kale also adds a little depth to the presentation. 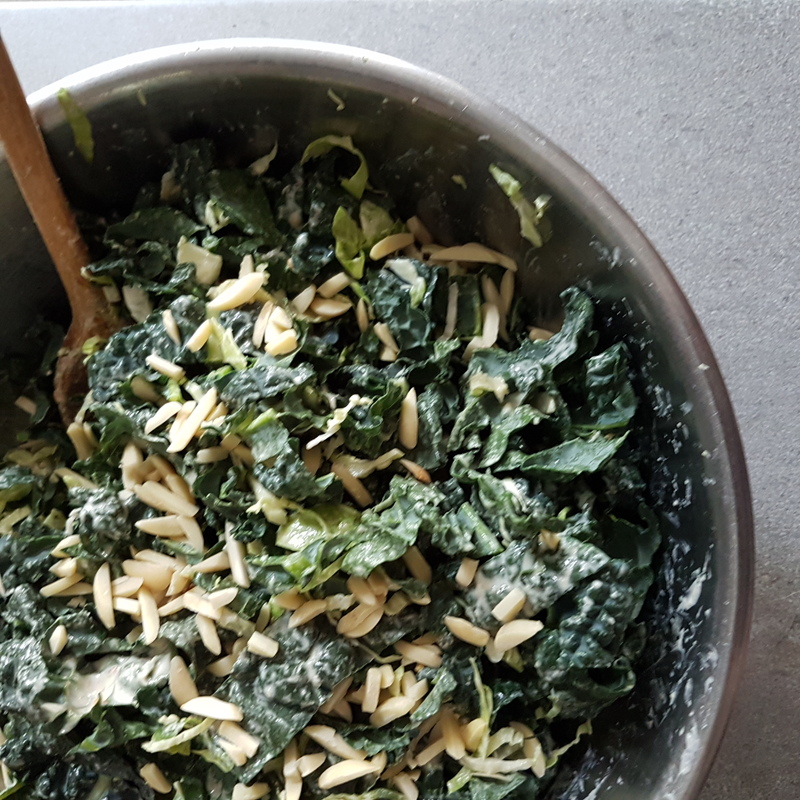 If you are unable to find it you can use regular green kale, just use salt and a high quality olive oil to massage the leaves a bit before cutting up. This will mellow the flavour a bit . There are huge benefits of including kale in your diet. One cup of kale aids in digestion, contains 3g of protein and 2.5g fiber which helps manage your blood sugar and helps you feel full. This time the salad was pretty straight forward but see how you can add some colour and pizazz! Try adding some shredded carrot, finely chopped apple or dried cranberries. The possibilities are endless! Use a knife to cut out the ribs of the kale leaves then chop into small, bite-sized pieces. Transfer the kale to a medium serving bowl. Chop off and discard the stem end of the brussels sprouts and any discolored outer leaves. Slice the sprouts as thin as possible and add to the bowl and use your fingers break up any clumps. In a small mixing bowl, whisk together the tahini, vinegar,honey and red pepper flakes. Whisk in the water until the mixture is smooth and creamy. Tahini can be a little thick, so if your dressing is too thick, add a bit more water and/or vinegar, to taste. Pour the dressing over the kale and sprouts and mix well. Add the slivered almonds and parmesan to the salad and toss. Serve immediately.